In two weeks from today, 4 July 2018, the 11th annual conference of English as a Lingua Franca will take place in London, UK. We’re very excited to announce that the conference schedule is now live! And perhaps even more excited about Day 1, because for the first time ever, the conference will launch with a day devoted entirely to the pedagogy of ELF. You have until Wednesday 27 June 2018 to register to attend the conference. What a fantastic opportunity to cross the bridge between research and practice – in a city which is “widely recognised as the most multilingual city in the world” (Graddol, 2006:28) and with some of the world’s foremost researchers and practitioners in the field of ELF pedagogy. We’re looking forward to it very much and hope to see you there! Graddol, D. (2006). English Next: Why global English may mean the end of ‘English as a Foreign Language’. Published online by the British Council. This is one of a series of short guest posts written by researchers who presented their work at the 10th annual ELF conference in June 2017. The following post was contributed by Juliana Souza da Silva and summarises her ELF10 presentation with Sávio Siqueira. You can read a short biography of Juliana at the end of this post. And click here to read more about the work Juliana and Sávio do within the ELF Brasil research team. Once we understand that Bilingual English Speakers (henceforth BESs) represent 80% of the total number of English users (Crystal 2003), we can estimate that most of ELF interactions are BES-BES, which, with at least 2 interlocutors, are going to feature a minimum of 3 languages: one first language of each speaker and, then, English. Although languages are theoretically named and delimited for political and didactic reasons (Irvine and Gal 2000), the actual relationship among them is fluid and in constant change. Such hybridity, inherent to human languages, has been unprecedentedly increased by the use of the internet, through which international linguistic encounters have become faster, cheaper and, consequently, exponentially more common. Considering the fact ELF conversations must include at least one BES, it becomes clear that ELF itself is intrinsically multilingual (Jenkins 2015). It does not mean that ELF interactions always happen smoothly, without any prejudice or conflicts. Languages are social acts. Therefore, human communication of any kind tends to reveal how we relate to ourselves and to others, and those relationships may be just as harmonious as they can be conflictive. And nothing has the power to trigger prejudice like a marked accent. That is why, to illustrate some of the complexity that characterize ELF-related multilingual issues, we revisited part of the data in Souza da Silva’s (2016) MA thesis, which was an international attitude study on Brazilian accents of English. Here I will only pinpoint the discussion topics developed in the article, where the detailed analysis of the data can be found, in order to explore the influence multilingualism may have on someone’s attitude towards non-hegemonic accents of English. We analyzed from two opposite perspectives how someone’s multilingual background (familiarity with other languages or accents) may affect intelligibility for the interlocutors. At first, it is common sense that the longer one has contact with an accent the better they are expected to understand it. However, this equation involves more than the ability to fine tune the listener’s ears to a set of sound patterns. It involves real people and their representation of themselves and their perception of others. Therefore, it is personal. And taking those variables into consideration makes the scenario of multilingual interactions much more complex than one might have imagined. In order to reflect on linguistic competence in the opinion of the non-specialist (though not exclusively) one needs to remember that the ‘how’, the ‘where’, and the ‘through whom’ someone first got in contact with a certain variety/dialect has an important role in the shaping of his or her perception of its mastery. For instance, if he/she learned English at home and uses it to accomplish daily tasks, there is a considerable chance linguistic competence is more closely related to intelligibility. Nevertheless, if someone learned another language for “life” and English at school as a second or foreign language, there is also a significant chance their view of competence is linked to the idea of matching the Standard variety they had as the target during their learning process. Willingness to understand a speaker whose accent is different from the regional or prestige one(s) will strongly depend on the kind of relationship the speakers have with each other, and that encompasses the group of people to whom they are socially linked. Thus, accents can be socially advantageous or disadvantageous, which is usually measured by how similar they are to the prestige ones. Studies about the relation between intelligibility and attitude towards language variation have shown that those two factors may simultaneously affect each other. Similarly, though, lower intelligibility might generate a more negative attitude. As pointed out by Jenkins (2000: 14), “intelligibility is not necessarily reciprocal and may be the result rather than the cause of negative social-psychological attitudes which have, themselves, reduced the receiver’s motivation to make an effort to understand”. Niedzielski’s (1999) analysis shows that when the geographical origin of the speaker was provided, the listeners changed their answer about how well they could understand the prompts. The knowledge of those expectations themselves is an important step towards addressing language discrimination and educating the general public, teachers and linguists included (Jenkins 2007). First and foremost, we need to contemplate the possibility of such familiarity with an accent not be a friendly case. Although meaning is negotiated online (Hua 2015), it does not usually happen without some degree of bias. Since for negotiation to take place there must be willingness of both interlocutors, its process depends heavily on the friendliness attached to the image of the group represented through that accent. That means familiarity with accents comes in handy if the interpretative party (the listener) of the interaction has a positive attitude towards that accent, but it might also work in the opposite direction. Although we have focused our reflections on the implications of familiarity to intelligibility, willingness to accommodate to others is not vulnerable only to social harmony between the groups represented. Alternatively, one may become communicatively cooperative simply because there is a task to be fulfilled (for his/her own benefit) that depends on the success of that linguistic interaction, as it is presented by Cogo (2016) when discussing Business English as a Lingua Franca (BELF). Those variables are the reason why studying attitudes towards language variation is a valid methodology to tackle ideologies that feed prejudice against minorities guised as linguistic prejudice (Garret 2010). Although not all communication hindrance is rooted in negative attitudes, that aspect plays an important role in the composition of language based interactions. Those investigations are also especially relevant to ELF (English as a Lingua Franca) studies as they reveal how expectations translate into evaluation of speakers, which might jeopardize comprehension. BESs stands for Bilingual English speakers and MESs for Monolingual English Speakers. Those terms were proposed by Jenkins (2000) to avoid the derogatory and inaccurate options Native Speakers and Non-Native Speakers. A marked accent is one that differs from the one the listener is used to, usually linked to a more prestigious variety of the language. Cogo, A. (2015) ‘They all take the risk and make the effort’: Intercultural Accommodation and Multilingualism in a BELF Community of Practice. Journal of English as a Lingua Franca, 4 (1): 365-383. Crystal, D. (2003) English as a Global Language. Cambridge: Cambridge University Press. Garret, P. (2010) Attitude to Language. Cambridge: Cambridge University Press. Hua, Z. (2015) Negotiation as the way of engagement in intercultural and lingua franca communication: frames of reference and interculturality. Journal of English as a Lingua Franca. 4 (1): 63-90. Irvine, J. T. and Gal, S. (2000) Language Ideology and Linguistic Differentiation. In: P.V. Kroskity. (Ed.) Regimes of Language: ideologies, politics, and identities. Santa Fe: School of American Research Press: 35-84. Jenkins, J. (2007) English as a Lingua Franca: attitude and identity. Oxford: Oxford University Press. Jenkins, J. (2015) Repositioning English and multilingualism in English as a Lingua Franca. Englishes in Practice, 2 (3): 49-85. Niedzielski, N. A. (1999) The effect of social information on the perception of sociolinguistic variables. Journal of Social Psychology (Special Edition), 18(1):62-85. Souza da Silva, J. (2016) Brazilian accents of English: an international attitude study. MA Thesis. Salvador: Bahia Federal University. Juliana Souza da Silva holds a Master’s degree from the Language and Culture Post-Graduation Programme at Bahia Federal University (UFBA). She also did her B.A. in English teaching at the same university. In her undergraduate and MA years, she conducted research on international attitudes towards Brazilian accents of English and their intelligibility, as well as possible ideological and pedagogical implications related to subject. As of July 2017, she is about to start her PhD studies on strategies for intelligibility used by Brazilian speakers of English in multilingual interactions under the supervision of Alessia Cogo at Goldsmiths University of London. The following post was contributed by Natasha Tsantila. You can read a short biography of Natasha and her work below. The global spread and diversified use of English in the contemporary world of international communication can certainly be seen “as a phenomenon of changing and changed times, language processes and language use” (Vettorel, 2015, p.1), where people, in their attempt to communicate effectively, have trespassed the traditionally conceived lingua-national and geographical borders. These changing tendencies are closely linked with the ELT world and, although well-debated in the past (e.i., Prodromou, 2006; Swan, 2012), call for further and well-informed reconsideration of ESOLers’ hitherto pedagogical practices so that learners’ global and pragmatic needs can be addressed effectively and realistically, focusing, mainly, on what is “relevant for their[learners’] individual requirements” (Widdowson, 2003). Within this scope, relevant ongoing research is being carried out in Greek EFL and EMI contexts (i.e., Georgountzou & Tsantila, 2016; Tsantila et al, 2016). This ELF10 presentation reported partial findings of two longer studies that have been conducted so far and makes recommendations on the development of meaningful and authentic ELT materials. Both studies used Likert type scale questionnaires and open ended questions. In the first study, EFL users’ preferences towards native and non-native accents and the associations these users make with accent-related stereotypes about speakers’ educational and intellectual background were explored. In the second study, EFL users’ degree of comprehensibility towards NNE varieties as well as their views on the potential inclusion of NNE varieties in class material were investigated. Findings indicated that the Greek EFL users still associate accent with higher education, knowledge, intelligence, and competence. However, recognizing that unfamiliarity with NNE accents will create problems of comprehensibility and effective interactions, they, thus, report that such a familiarization is crucially important as it will facilitate their comprehension towards unfamiliar accents and ultimately enhance their interactions in the global setting. So, they indicated open-mindedness to their subsequent exposure to NNE accents pinpointing the need for mutual comprehensibility, intercultural awareness, successful employability, etc. These findings, contrary to: a) our initial hypothesis that the Greek English language students are reluctant to be exposed to NNE accents, b) the negative stereotypical associations they still make about users’ accented speech, c) the existing ELT materials (Vettorel & Lopriore, 2013) and d) teachers’ beliefs and practices in Greece (Sifakis & Fay, 2011; Sifakis & Sougari, 2005, 2011), indicate that Greek EFL learners, and prospective English language users, have started acknowledging the necessity as well as the benefits they will have from their exposure to NNE varieties. pedagogical practices stemming from the ELT and ELF research (i.e., Lopriore & Vettorel, 2015; Kohn, 2016) be followed. This way learners and prospective users of English may significantly: a) “develop specific comprehension skills, for coping with unfamiliar pronunciation and unclear meanings” (Kohn, 2015), b) eventually build their confidence in interacting effectively in various diversified and multicultural contexts, and finally c) get acquainted with other NNE cultures, ultimately, enhancing their ability to comprehend various diversified and multicultural texts and contexts. ￼￼Therefore, all considered, it is important that ESOLers familiarize themselves with the global character of English, develop their own understanding of the ways this new reality can be integrated in classroom context and seriously explore, the “design, implementation and evaluation of instructional activities [and materials] that reflect and localise” (Sifakis and Bayyurt p.7) this reality. Fay, R., Lytra, V & Ntavaliagkou, M. (2010) Multicultural awareness through English: A potential contribution of TESOL in Greek schools. Intercultural Education, 21(6), 581-595. Georgountzou, A. and Tsantila, A. (2016). kju:kʌmb∂(r)/or /kukumber/? Preferences and attitudes towards standard accents in the Greek ELF context. In Tsantila, N. Mandalios, J., & Ilkos M.(Eds) ELF: Pedagogical and Interdisciplinary Perspectives. Athens: DEREE-The American College of Greece. Jenkins, J. (2009). English as a lingua franca: Interpretations and attitudes. World Englishes 28(2), 200-207. Kohn, K. (2015). A pedagogical space for ELF in the English classroom. In Y. Bayyurt & S. Akcan (Eds. ), Current perspectives on pedagogy for English as a Lingua Franca, (51–68). Berlin: Mouton de Gruyter. Kohn, K. (2016). Teaching towards ELF competence in the English classroom. In N. Tsantila, J. Mandalios and M. Ilkos (Eds. ), ELF: Pedagogical and interdisciplinary perspectives (pp. 25-32). Athens: Deree – The American College of Greece. Lopriore, L and Vettorel, P. (2015). Promoting awareness of Englishes and ELF in the English language classroom. In H. Bowles and A. Cogo (Eds), International perspectives on English as a Lingua Franca: Pedagogical insights (pp. 13-34). Basingtoke: Palgrave Macmillan. Seidlhofer, B. (2003). A concept of international English and related issues: From ‘Real English’ to ‘Realistic English’? In Council of Europe. Language Policy Division. Strasbourg: Council of Europe. Sifakis, N.C. and Bayyurt, Y. (2017) ELF-aware teacher education and development. In J. Jenkins, W. Baker and M. Dewey (eds.) The Routledge Handbook on English as a Lingua Franca. London: Routledge. Sifakis, N.and Sougari, A.M. (2011) Between a Rock and a Hard Place: An Investigation of EFL teachers’ beliefs on what Keeps them from integrating Global English in their classrooms. In C. Gagliardi, & A. Maley (Eds. ); EIL, ELF, Global English: Teaching and Learning Issues. Bern, Switzerland: Peter Lang, (pp. 301-320). Sifakis, N. C., & Sougari, A. (2005). Pronunciation Issues and EIL Pedagogy in the Periphery: A Survey of Greek State School Teachers’ Beliefs. TESOL Quarterly, 39(3), 467- 488. Tsantila, N, Ganetsou, E, & Ilkos M.(2016) “Student Attitudes towards Accented English: The American College of Greece Context” In L. Lopriore & E. Grazzi (eds) Intercultural Communication: new perspectives from ELF. Rome: Roma TrE-Press, (pp. 321-344). Vettorel, P. (2015). New frontiers in teaching and learning English Newcastle upon Tyne: Cambridge Scholars Publishing. Vettorel, P. & Lopriore L. (2013). Is there ELF in ELT coursebooks? Studies in Second Language Learning and Teaching, 3 (4). 483-504. Widdowson, H. (2003). Defining issues in English language teaching, Oxford: Oxford University Press. Natasha Tsantila has been working at Deree- the American College of Greece, since 1989, where she has taught and designed courses in academic writing and Linguistics. She has worked as English language Programme coordinator and teacher trainer in language centers in Greece. Her professional interests include language and identity, teacher education, language and pedagogy, teaching English as an International language. She has presented in international conferences, IAWE, ELF and TESOL and has published on ELF and attitudes as well as on EFL and identity. She has been currently working on her PhD on ELF and ELT materials. The following post was contributed by Yoko Uchida and Junko Sugimoto. You can read a short biography of Yoko and Junko and their work at the end of this post. The acquisition of appropriate pronunciation in English instruction often poses a significant challenge for non-native English teachers. Although the prevalent use of English as a lingua franca (ELF) is widely recognized, and its application to pedagogy is encouraged by many researchers (Jenkins, 2000; Seidlhofer, 2011), its significance does not seem to be sufficiently acknowledged in classrooms and among non-native teachers (Jenkins 2007; Timmis, 2002). This seems to be the case also in Japan. We conducted a questionnaire survey of 100 junior high school teachers in Tokyo, and found that most believed teachers’ pronunciation should not have traces of a Japanese accent, and that teachers should instead acquire native-speaker accents (Uchida & Sugimoto, 2016). A follow-up study asking the same questions to 16 Japanese college students enrolled in a teacher-training program also obtained a similar result—the majority of the preservice teachers aimed to have native-speaker (mostly American) pronunciation. This prompted us, as phoneticians and phonetics instructors of the teacher-training curriculum at the university level, to further investigate the underlying reasons behind Japanese teachers’ preference for native-speaker English. Why do they pursue such an unrealistic goal when merely acquiring intelligible pronunciation is acceptable (Celce-Murcia et al., 2010)? What makes them hesitant to set a more attainable goal? What should be included in our phonetics class to enable the preservice teachers to acquire a better perspective of ELF-oriented pedagogy? To find answers to these questions, we had the same preservice teachers read two texts that introduce the concept of ELF, and then asked them to answer an open-ended essay question: What kind of pronunciation should English teachers aim at? The responses were qualitatively analyzed after classifying them into five categories: teacher’s roles, native-speaker accents, Japanese-accented English, attainability, and intelligibility. Many responses associated teacher’s roles with positive attributes such as “good” and “correct.” Also, as a role model for students, many respondents believe teachers should set a “higher goal” for themselves and conduct classes with “native-like” pronunciation. Native-speaker accents were described with positive adjectives such as “correct,” “perfect,” “authentic,” and “intelligible.” In contrast, negative labels such as “bad habits,” “difficult to understand,” and “not acceptable,” were assigned to Japanese-accented English. No one mentioned the association of the Japanese accent with their identity (c.f. Sung, 2016). With regard to attainability, the Japanese accent was considered “more realistic and attainable” compared to native-speaker accents that are “more desirable but less attainable.” The importance of intelligibility was acknowledged overall, but there was no mention of what intelligible pronunciation is or what the threshold level is. The results revealed a few misconceptions held by the preservice teachers, one of which was the persistent belief that teachers should sound like native speakers. For example, they believed that teachers should speak with better pronunciation than students to serve as a role model, but did not realize that better pronunciation did not necessarily equate to native-like pronunciation. In our opinion, however, to become good role models to their students, they do not need to speak with a native accent, but need to be able to communicate efficiently with native and non-native speakers alike using appropriate communication strategies. Many respondents also did not seem to fully understand that there is more NNS-NNS communication today than NS-NNS communication. Another misconception is the belief that native accents are always correct and more intelligible. One reason behind this misconception is that teachers have exposure to limited varieties and types of English accents in Japanese classrooms. Many assistant language teachers (ALTs) are from the Inner Circle countries and enunciate clearly in the class. In addition, textbook audio materials use mostly North American accents spoken slowly and clearly (Sugimoto & Uchida, 2016). As Japan is mostly a monolingual society, neither teachers nor students have sufficient exposure to different varieties and types of English, which can be heavily accented (whether it be a native or non-native variety), spoken at a fast rate, or pronounced unclearly (depending on the contexts of language use). As for the comment that the Japanese accent is not intelligible, unfortunately, there are studies that report negative attitudes toward the Japanese accent (e.g. Jenkins, 2007); therefore, it appears the respondents’ claim holds true to some extent. However, when it comes to determining what part of the Japanese accent affects intelligibility, previous studies have not provided convincing data, and further investigation is required. Responses by the preservice teachers appear to stem from the fundamental fact that Japanese speakers of English lack sufficient interaction with diverse English users and have never had their English challenged in terms of intelligibility. For instance, the respondents’ misconception that native-speaker varieties are more intelligible can be rectified if they listen to a wider variety of native-speaker accents and to intelligible non-native pronunciation, which can serve as good models (Murphy, 2014). Japanese speakers of English need to experience communication breakdowns many times through communication with both native and non-native speakers, and need to face situations in which they need to accommodate their speech. In our opinion, this would be indispensable for them to truly understand what intelligible pronunciation is. As phoneticians and teacher-training instructors, our job includes helping our students correctly understand the current use of ELF and incorporating and introducing various resources available (e.g., Internet chat services, international television broadcasting), which will help them experience using ELF both inside and outside classrooms (c.f. Matsuda, 2003). In short, the notion of ELF can be introduced through teaching, but intensive hands-on experience is essential to acquire a complete understanding of it. Celce-Murcia, M., Brinton, D. M., Goodwin, J. M. (with Griner, B.) (2010). Teaching Pronunciation: A Course Book and Reference Guide. New York: Cambridge University Press. Jenkins, J. (2007). English as a Lingua Franca: Attitude and Identity. Oxford: Oxford University Press. Matsuda, A. (2003). Incorporating world Englishes in teaching English as an international language. TESOL Quarterly, 37, 719-729. Murphy, J. (2014). 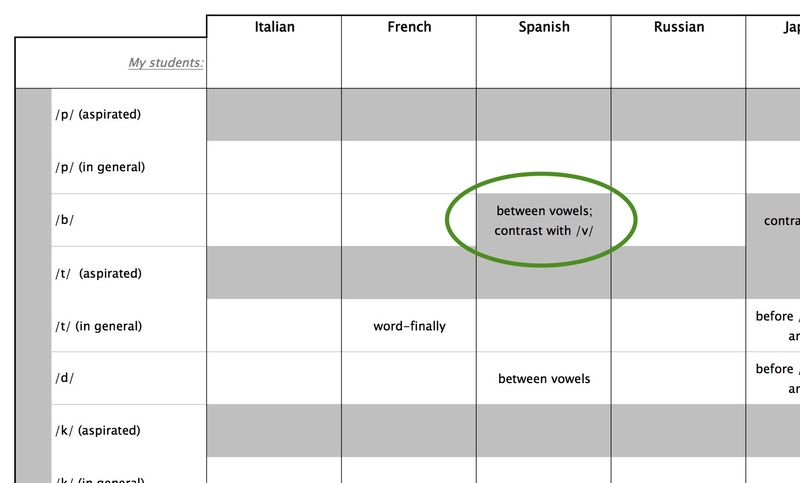 Intelligible, comprehensible, non-native models in ESL/EFL pronunciation teaching. System 42, 258–269. Seidlhofer, B. (2011). Understanding English as a Lingua Franca. Oxford: Oxford University Press. Sugimoto, J., & Uchida, Y. (2016). A variety of English accents used in teaching materials targeting Japanese learners. Proceedings of the 1st International Symposium on Applied Phonetics, 43-47. Sung, C.C.M. (2016). Does accent matter? Investigating the relationship between accent and identity in English as a lingua franca communication. System, 60, 55-65. Timmis, I. (2002). Native-speaker norms and international English: A classroom view. ELT Journal, 56, 240-249. Uchida, Y., & Sugimoto, J. (2016). A survey of Japanese English teachers’ attitudes towards pronunciation teaching and knowledge on phonetics: Confidence and teaching. Proceedings of the 1st International Symposium on Applied Phonetics, 38-42. Yoko UCHIDA studied at Tokyo University of Foreign Studies and obtained her PhD in Humanities in 2001. She is currently a professor at Tokyo University of Marine Science and Technology. Her research interests include, but are not limited to, the perception of English sounds by Japanese speakers, intelligibility, and Maritime English. One of her current topics is the pursuit of intelligibility levels expected of different groups of native Japanese speakers who use English in different contexts and for different purposes. Junko SUGIMOTO is currently a lecturer at the University of the Sacred Heart, Tokyo. She has an MA in Phonetics from University College London. Her research interests include the acquisition of rhythm and intonation by Japanese learners of English, teaching pronunciation, and intelligibility. She is currently focusing on how to effectively teach selected segmentals and suprasegmentals that affect intelligibility to Japanese learners of English. The following post was contributed by Christie Heike. You can read a short biography of Christie and her work below. Jenkins (2000, 2002) proposed that learners who are preparing to engage in English as a lingua franca (ELF) need to be taught not only how to pronounce specific features, but also how to accommodate phonologically – that is, how to make adjustments to their pronunciation where they receive signals from their interlocutors that their pronunciation is causing problems for intelligibility. In examining how phonological accommodation manifests itself in ELF situations, Jenkins observed that where speakers from different L1 backgrounds are motivated by a desire to be intelligible to one another, they will adjust their pronunciation of core features toward their only shared resource: target-like pronunciation. Therefore, Jenkins proposed that the teaching of productive phonological accommodation in multilingual classes should be a relatively straightforward process. All work on phonological accommodation should be prefaced by instruction and controlled practice of core features to ensure that learners have these features in their productive repertoires. After that, the key element for teaching accommodation in multilingual classes is to create situations in which learners can communicate with a classmate from another first language background. Preferably this should take place in information exchange tasks involving a measurable outcome (e.g. learner-learner dictation, describe-and-draw tasks, giving directions, information gap activities), since Jenkins found that this increases the saliency of intelligibility and thus encourages the use of accommodation. This allows learners to notice for themselves where their pronunciation has caused problems for intelligibility and gives them the chance to practice replacing problematic pronunciation with more target-like pronunciation. But what do we do with largely monolingual groups, in which most or all of the learners come from the same linguistic background? In classes like this, it is patently impossible to arrange the learners into pairs or groups in which each learner comes from a different first language background. And Jenkins observed that when learners from the same L1 background engage in these same communicative tasks, they converge not on more target-like pronunciation, but rather on their common L1-influenced pronunciation. While this actually does increase their intelligibility and allow them to complete the task successfully, it is undesirable for ELF-oriented teaching for two reasons: First, it does not give learners practice in the kind of accommodation they will actually need to engage in as speakers in ELF situations. Second, it actually undermines pronunciation teaching in that it reinforces the learners’ L1-influenced accent, leading them away from the development of more target-like pronunciation of core features. Therefore, the parameters that lead to successful accommodation practice in multilingual classes will not lead to success in monolingual ones. So how can we give learners in monolingual learning groups practice in the kind of phonological accommodation they need to be able to engage in in actual ELF talk? To date, very few solutions have been proposed to this problem. One solution, proposed by Walker (2005, 2010), involves the use of learner recordings. In many ways, this task is similar to the tasks Jenkins recommends for multilingual classes: it is prefaced by instruction and practice, it involves learner speaking to learner, and it features a task with a measurable outcome. However, the key parameter here seems to be a focus on a limited set of features. Walker posits the idea that by focusing on a limited set of features in which learners have received instruction and practice, we can trust them to converge on target-like pronunciation rather than L1-influenced pronunciation despite the fact that they are working in monolingual groups (Walker 2005: 554). As part of my doctoral research project on integrating an ELF orientation into tertiary-level practical English courses, I hypothesized that this key principle – constructing tasks in such a way that they focus learners’ attention on a limited set of features – might allow teachers to use other kinds of tasks that would encourage learners from monolingual learning groups to practice adjusting their pronunciation toward the target in response to peer feedback. I built several such tasks into a pilot course held at the Technical University of Kaiserslautern in 2013. In analyzing the transcripts of these tasks, I found that, where the students’ attention was drawn to a specific set of pronunciation features both by previous instruction and by the task parameters, students did in fact adjust their pronunciation toward more target-like pronunciation despite working in monolingual groups. This often took the form of students negotiating together the target-like pronunciation of pronunciation features targeted by that lesson. 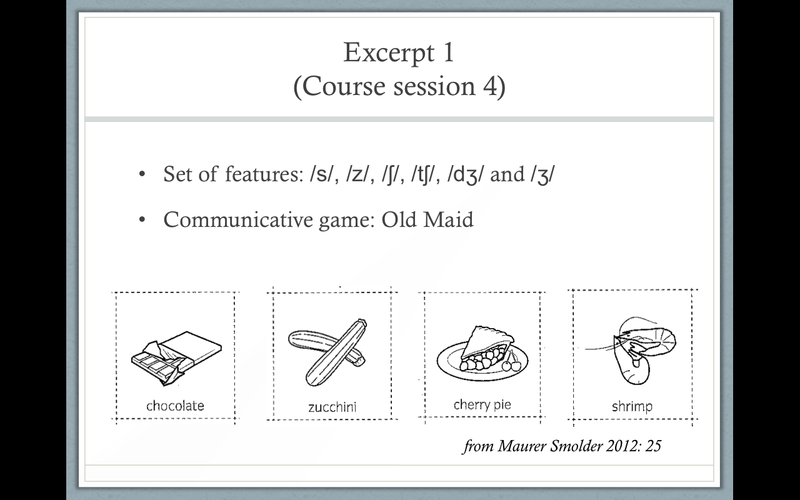 For example, in a twist on the card game Old Maid (Maurer Smolder 2012: 25), students had to find pairs of words featuring the same sound from a set of six consonant sounds that comprised the focus of the lesson. This led to a lot of discussion within the groups as the students tried to decide which words constituted a pair and which did not. In considering whether the words peas and beans could be a pair, one group was able to converge on a more target-like pronunciation of the word-final /z/ in both words. In other tasks, task parameters also led students to adjust their pronunciation toward the target in response to requests for confirmation from other students. 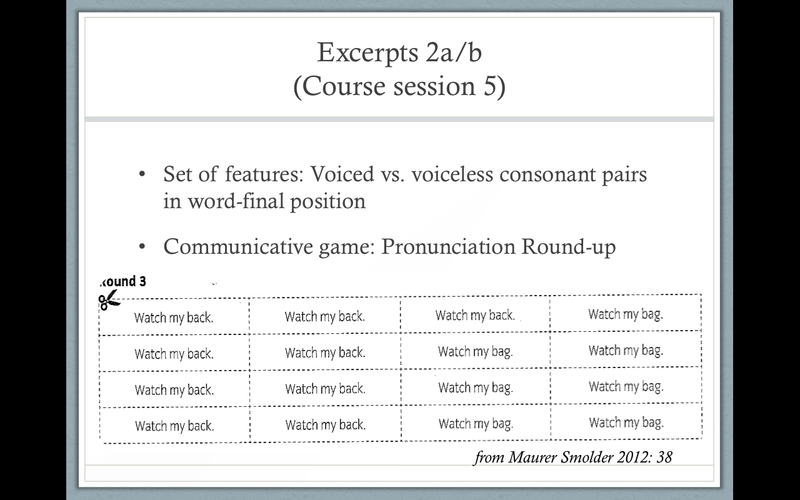 This happened particularly where tasks were constructed around minimal pairs, such as during the game Pronunciation Round-up in a lesson on voicing final voiced consonants (Maurer Smolder 2012: 38). It would appear, then, that communicative pronunciation tasks designed around a limited set of features in which learners have had previous instruction and practice can facilitate practice in adjusting pronunciation toward the target in response to peer feedback, even in monolingual learning groups. While it is in some ways problematic to call this type of adjustment accommodation in the full sense of the term, it nevertheless provides learners with practice in important pre-requisite skills for the kind of phonological accommodation they will need to engage in in actual ELF interactions. Jenkins, Jennifer (2000) The Phonology of English as an International Language. Oxford: Oxford University Press. Jenkins, Jennifer (2002) A sociolinguistically based, empirically researched pronunciation syllabus for EIL. Applied Linguistics 23/1, 83-103. Maurer Smolder, Christina (2012) Be Understood! A pronunciation resource for every classroom. Cambridge: Cambridge University Press. Walker, Robin (2005) Using student-produced recordings with monolingual groups to provide effective, individualized pronunciation practice. TESOL Quarterly 39/3, 535-542. Walker, Robin (2010) Teaching the Pronunciation of English as a Lingua Franca. Oxford: Oxford University Press. Christie Heike is a lecturer at the Europe-University of Flensburg in Germany, where she received her Master of Education in English and music in 2011. She is currently working on her dissertation, entitled “Reevaluating the Teaching of English for International Communication”. Her study focuses on how insights from ELF research might be applied to practical English courses at the tertiary level in order to better prepare students for using English as a lingua franca. In addition to her research, she also teaches in the English department in the areas of linguistics and teacher education. ELF10 report: What happens when ELF users try to understand each other’s accents? The following post was contributed by Veronika Thir. You can read a short biography of Veronika and her work at the end of the post. What happens when ELF users try to understand each other’s accents? Language teachers are often painfully aware of the limited time they have in the classroom to equip their learners with what they need for international communication. Therefore, they are always interested in knowing what aspect of language (use) they should focus on most in their lessons. Grammar? Vocabulary? Pronunciation? Communication strategies? In the past, some claims have been made that pronunciation seems to be a particularly serious ‘problem area’ for users of ELF in that it turned out to be the major source of communication problems in some studies (Jenkins 2000, Deterding 2013). Accordingly, calls have been made for a stronger focus on pronunciation in the ELT classroom. However, what has often been overlooked is that a couple of other studies (e.g. Mauranen (2006), Pitzl (2010) or Kaur (2011)) did not actually find pronunciation to be a serious problem for mutual understanding in ELF communication. It seems that pronunciation might sometimes be responsible for the vast majority of communication problems in ELF talk, while sometimes, it is not much of a problem at all. But how can we explain this variable role of pronunciation for successful ELF communication? 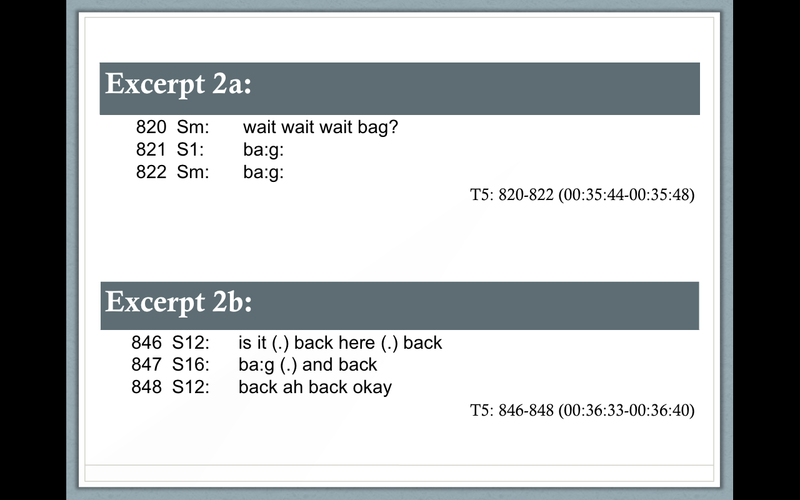 One possible explanation is the availability of co-text and context in certain situations. If we process each other’s pronunciation to recognize words in the stream of speech, we do not only draw on the sounds we hear (‘bottom-up’ processing). We also use information from the linguistic co-text and the extra-linguistic context to make sense of what we hear (‘top-down’ processing). Let me provide an example: if we hear someone saying “I [s]ink this is a nice idea”, we will most probably not assume that the person intends to say ‘sink’ but that they mean ‘think’, because the lexical and syntactic co-text do not support our interpretation of ‘sink’. Possibly, the situational context will also provide us with certain cues that lead us to prefer ‘think’ over ‘sink’ in our interpretation. We might also consider our knowledge of the speaker (e.g. that they often replace ‘th’ with ‘s’) and use this information to interpret what they say, and conclude that ‘think’ is the intended word. What I’m getting at is that both co-text and context can supply the listener with cues that might help them to compensate for ambiguities in the acoustic signal. This is why Brown (1989) called context “a powerful disambiguator“. If co-textual and/or contextual cues are sparse or absent, a certain accent might quickly become much more of a problem than it would have been otherwise. The interesting thing is that we do not yet really know how much of an impact co-textual and contextual cues have on the intelligibility of pronunciation in ELF communication. Jennifer Jenkins (2000) observed that ELF users sometimes seem to be unable to profit from such cues when trying to understand one another. However, other ELF researchers have suggested that co-text and context might very well be an important additional source of information for ELF listeners in understanding their interlocutor’s accent (Deterding (2012), Luchini & Kennedy (2013), Osimk (2009)). My doctoral research aims to shed more light on the role of co-textual and contextual cues when ELF users process each other’s accents. To this end, I recently carried out a pilot study, part of which I presented at ELF10. I gathered data from 2 pairs of ELF speakers who completed two communicative tasks under different conditions: the experimental condition, which involved the presence of a certain ‘schematic’ context which participants were able to draw on in order to make sense of their interlocutor’s speech, and the control condition, in which no such context was available. Each pair completed one of the two tasks (map-task and spot-the-difference task) under the experimental condition and one task under the control condition. All interactions were video-recorded and each participant re-watched the video of the interactions they had taken part in together with me in order to help me identify all instances of phonological intelligibility problems in the data and clarify their sources. I then analysed each instance qualitatively, in particular with regard to the presence or absence of schematic or visual context and linguistic co-text. The ELF speakers in this study did use co-textual and contextual cues in understanding each other’s accents. They did so not only when hearing something for the first time, but also when trying to resolve intelligibility problems and negotiating meaning. Apart from linguistic co-text, visual context (e.g. in the form of the map in front of them, or their partner’s body language) and verbal cues evoking part of a relevant schema (e.g. “the place with animals” for ‘zoo’) turned out to be helpful in resolving comprehension difficulties. Most of the time they were used, co-textual and contextual cues turned out to be helpful to ELF users, in that they aided them in correctly identifying the word(s) their partner was uttering. However, in some cases such cues were unhelpful, in that they led the listener in the wrong direction by supporting an incorrect interpretation of their partner’s pronunciation. In the absence of co-textual and contextual cues, there seems to be a greater danger of misunderstanding. The few true misunderstandings in my data – i.e. instances where the listeners thought they had understood the word their partner was uttering when in fact they had not – all occurred in the control condition without schematic context. In each case, the reason the listener thought they had understood correctly seemed to be that there were no co-textual or contextual cues that would have led them to question their understanding – their interpretation of their partner’s pronunciation seemed accurate during the task. This suggests that a lack of co-text and context can be detrimental to communicative success in that it prevents ELF users from noticing a problem and, therefore, clarifying it. drawing their listeners’ attention to the physical context (again e.g. by using body language). All of these strategies might help learners to resolve or prevent phonological intelligibility problems in ELF talk if they are unable to resolve or prevent them otherwise, e.g. by getting a particular sound right. Possibly, certain contexts of real-life language use might be identified that maximize the risk of phonological intelligibility problems in ELF talk in contrast to those that minimize them. In this case, it will be important to raise learners’ awareness of the contexts in which they need to either pay particular attention to their pronunciation or employ the communication strategies mentioned above to prevent intelligibility problems. However, as mentioned above, a lot more research is still needed to further explore and confirm (or not) the tendencies I observed in my study. I’m on it! So, watch this space! This ‘interactive’ view on processing speech has been supported by research findings in psycholinguistics (see e.g. Byrd & Mintz 2010: 162) and on the intelligibility of L2 speech (Zielinski 2006). These 2 pairs were selected from a pool of 5 pairs participating in this study, as they turned out to be fairly comparable in terms of certain extra-linguistic factors that have been found to affect intelligibility, such as familiarity with their partner’s accent and language attitudes (this information was obtained through a follow-up questionnaire). However, they were not comparable in terms of production, in that the strength of their L1 accent was different. It is therefore problematic to compare the 2 pairs directly to each other, which is why I decided to focus on comparing the 2 task conditions rather than the 2 pairs. Brown, Adam. 1989. “Some thoughts on intelligibility”. The English Teacher XVIII. http://www.melta.org.my/ET/1989/main4.html (January 16, 2016). Byrd, Dani; Mintz, Toben H. 2010. Discovering speech, words, and mind. Malden, Mass: Wiley-Blackwell. Deterding, David. 2012. “Intelligibility in spoken ELF”. Journal of English as a Lingua Franca 1(1), 185–190. Deterding, David. 2013. Misunderstandings in English as a Lingua Franca. Berlin: de Gruyter Mouton. Jenkins, Jennifer. 2000. The phonology of English as an international language. Oxford: Oxford University Press. Kaur, Jagdish. 2011. “Intercultural communication in English as a lingua franca”. Intercultural Pragmatics 8(1), 93–116. Luchini, Pedro L.; Kennedy, Sara. 2013. “Exploring sources of phonological unintelligibility in spontaneous speech”. International Journal of English and Literature 4(3), 79–88. Mauranen, Anna. 2006. “Signaling and preventing misunderstanding in English as lingua franca communication”. International Journal of the Sociology of Language 2006(177), 123–150. Osimk, Ruth. 2009. “Decoding sounds”. Vienna English Working Papers 18(1), 64–89. Pitzl, Marie-Luise. 2010. English as a lingua franca in international business. Saarbrücken: VDM Müller. Zielinski, Beth. 2006. Reduced intelligibility in L2 speakers of English. Bundoora, Victoria. Veronika Thir is a university assistant and PhD student at the English Department of the University of Vienna, where she obtained a teaching degree in English and French. During her studies, she has worked as a student tutor for practical English phonetics. While her MA thesis focused on the pedagogical implications of ELF research for teaching English pronunciation at university level (see also her article in VIEWS, 2016), her PhD project seeks to contribute to research on phonological intelligibility in ELF by exploring the interplay of pronunciation, co-text and context. She has also presented at various academic conferences. As with all linguistic interaction, intelligibility is undoubtedly a two-way street – that is, it’s not only the speaker’s responsibility to make him/herself understood to others, but the listener also has the task of understanding. In the classroom, we can work on both sides. In other words, we can help develop learners’ productive and receptive competence. In the multilingual classroom, however, this situation gets a bit complicated. In my experience, if you have a classroom full of learners from different L1 (first language) backgrounds, they sometimes experience difficulties making their pronunciation intelligible to each other. One problem lies with the listeners: they’re often unfamiliar with the pronunciation of English speakers from backgrounds other than their own. Another problem lies with the speakers (and the teacher): how to address the particular difficulties of a student from an L1 background with which the teacher is unfamiliar? Many English teachers I know speak another language, maybe even two other languages. But it’s rare for them to be well-acquainted with ten different L1s – and yet this is just the situation they may face in the multilingual classroom. The multilingual classroom is a ready-made ELF environment, but teachers may struggle to exploit this opportunity due to a lack of detailed background knowledge or suitable reference material that makes it reasonably quick and easy* to work out what to prioritise in a class full of learners from different L1 backgrounds. This is the problem I set out to solve with my MA research, which I completed a few months ago. I created a grid which featured details of the typical areas of pronunciation difficulty of 12 different L1 backgrounds, contrasted against the LFC. This means that aspirating this sound is generally difficult for Italian speakers. This means producing this sound is not usually problematic for Italian speakers (they just have trouble aspirating it, as is sometimes necessary in English). This means this sound is generally problematic for Spanish speakers, and ESPECIALLY (1) when it occurs between vowels and (2) the contrast with /v/. This means that producing this sound is not generally a problem for Spanish speakers, but that it can be difficult to pronounce accurately between vowels. Imagine I had 6 students in my class, whose first languages were French, Italian, Arabic, Portuguese, Chinese and Hungarian. 2. Then I’d look at the extent to which these learners are likely to have similar difficulties, and I’d work out my priorities. 3. Written out separately, this would be the resultant syllabus. Great! Can I have a copy of that grid? 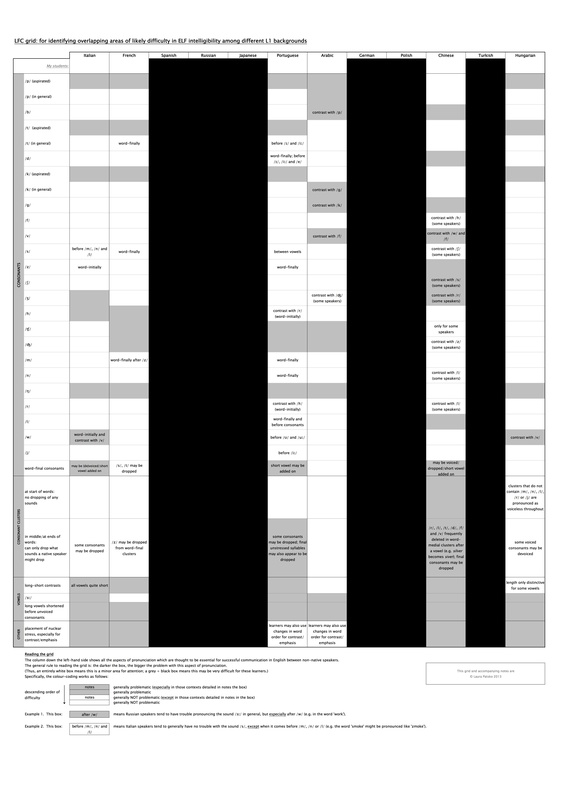 You can download the full grid here and the accompanying teacher’s notes here. The files are in PDF format. You can either view it on-screen or print it out – but note, it’s formatted for printing on A3 size paper (otherwise it’d be too small to read!). Academic literature on phonology and the Lingua Franca Core uses a lot of terminology which many teachers are not familiar with. 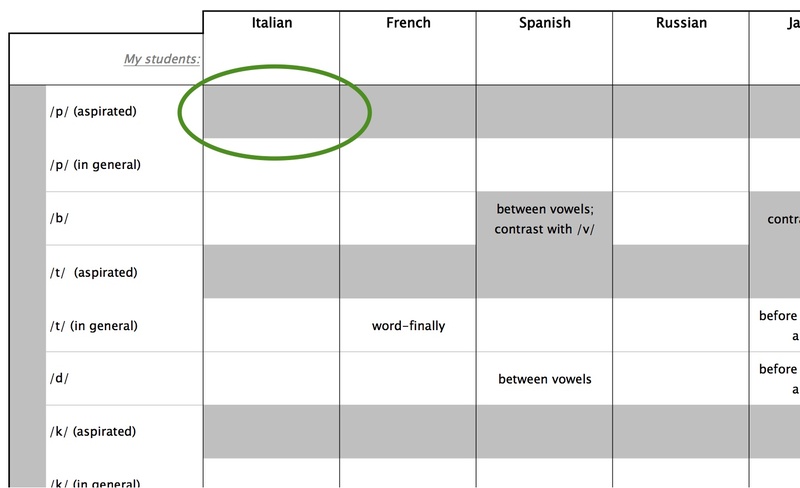 The terms in this LFC grid have therefore been standardised, simplified & defined to make it more accessible to teachers without extensive phonology training (e.g. ‘paragoge’ and ‘epenthesis’ have been avoided in favour of ‘adding short vowel sounds’; ‘tense’ and ‘lax’ vowels have been called ‘long/short vowels’, though I acknowledge the somewhat problematic/ imprecise nature of this substitution). The information in the grid has been collated from many sources, some of which take ELF as their starting point and some of which don’t, some of which refer to particular varieties of an L1 (e.g. Brazilian Portuguese) and some of which refer to different varieties (e.g. European Portuguese). 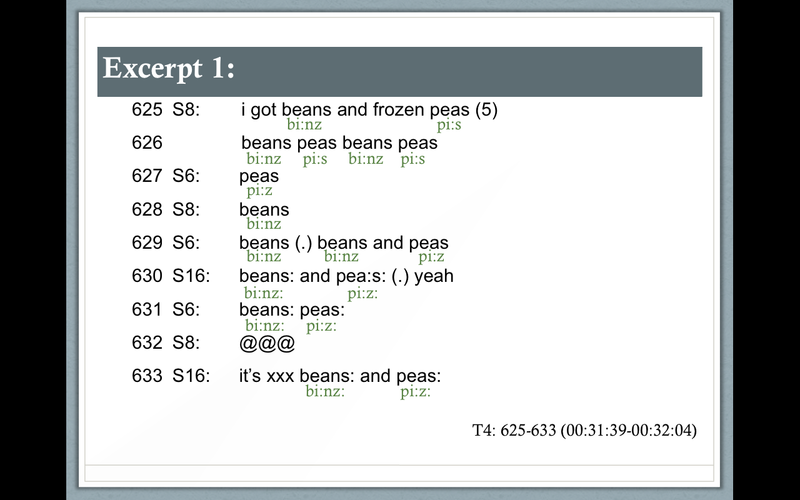 Including the greyscale code allows the grid to be a bit flexible vis à vis what different authors have written. Nuclear stress is an area which doesn’t receive a lot of attention in ELT training courses. We’ve covered this in more detail in another blog post. For now, if you want to learn more, see Jenkins (2000:154-5) for more thorough discussion. 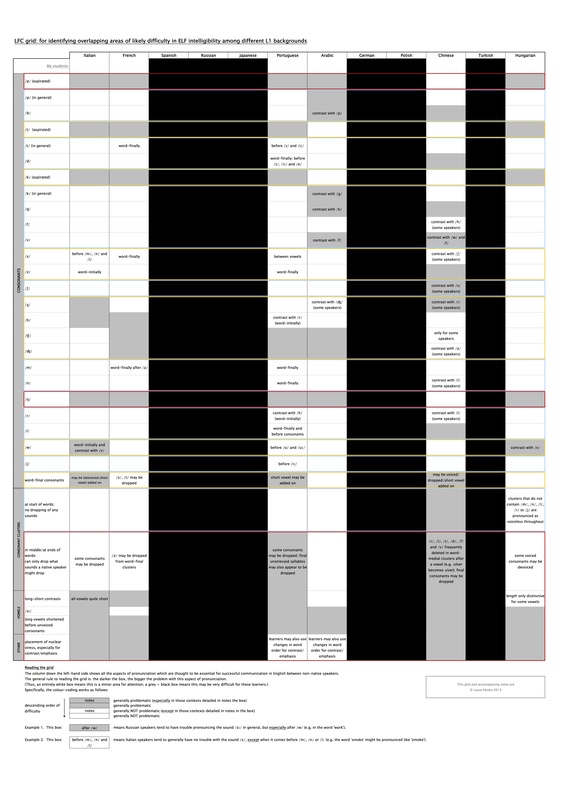 I originally made this grid as part of my MA research and piloted it at my own school. So the 12 L1s included reflect the most common L1 backgrounds represented in classrooms at my school. In future, I hope to extend the grid to include more L1s. Baker, A. (1982). Introducing English pronunciation: A teacher’s guide to ‘Tree or three?’ and ‘Ship or sheep?’. Cambridge: Cambridge University Press. Kallestinova, E. (2009). ‘Voice and aspiration of stops in Turkish’, Folia Linguistica, Vol. 38, Issue 1-2, pp. 117-144. Rogerson-Revell, P. (2011). English phonology and pronunciation teaching. London: Continuum. Siptár, P. & M. Törkenczy (2000). The phonology of Hungarian. Oxford: Oxford University Press. Varga, L. (1975). ‘A contrastive analysis of English and Hungarian sentence prosody’. Working papers of the Hungarian-English Contrastive Linguistics Project. Published by the Linguistics Institute of the Hungarian Academy of Sciences and Center for Applied Linguistics. Walker, R. (2001). ‘Pronunciation priorities, the Lingua Franca Core, and monolingual groups’. Speak Out! The newsletter of the IATEFL Pronunciation Special Interest Group. 18: 4-9. Zhang, F. & P. Yin (2009). ‘A study of pronunciation problems of English learners in China’. Asian Social Science, Vol. 5, No. 6, pp. 141-146. Zoghbor, W. (2009). ‘The implications of the LFC for the Arab context’. Speak Out! The newsletter of the IATEFL Pronunciation Special Interest Group. 41: 25-29.